Thou, Mother, dying in so many ways, pierced by such dreadful sorrows, didst not die. Lady, who by thy sweetness dost ravish the hearts of men, hast thou not ravished mine? O ravisher of hearts, when wilt thou restore me mine? Rule and govern it like thine own; preserve it in the Blood of the Lamb, and place it in thy Son's side. Then shall I obtain what I desire, and possess what I hope for; for thou art our hope. 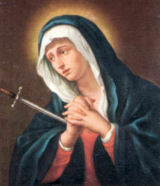 The month of September (Overview - Calendar) is dedicated to the Seven Sorrows of Mary. Devotion to the sorrows of the Virgin Mary dates from the twelfth century, when it made its appearance in monastic circles under the influence of St. Anselm and St. Bernard. The Cistercians and then the Servites undertook to propagate it. It became widespread in the fourteenth and especially the fifteenth centuries, particularly in the Rhineland and Flanders, where Confraternities of the Sorrowful Mother sprang up. It was in this context that the first liturgical formularies in her honor were composed. A provincial council of Mainz in 1423 made use of these in establishing a "Feast of the Sorrows of Mary" in reparation for Hussite profanations of her images. Some Churches had previously celebrated this feast during the Easter season. 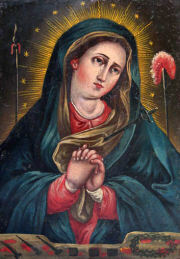 Others, however, celebrated the Joys of the Blessed Virgin during the Easter season, as is still done today at Braga. In some places it was entitled "Recollection of the Feasts and Joys of the Blessed Virgin Mary." Excerpted from The Church at Prayer, Vol. IV A.G. Martimort. God vouchsafed to select the very things about Him which are most incommunicable, and in a most mysteriously real way communicate them to her. See how He had already mixed her up with the eternal designs of creation, making her almost a partial cause and partial model of it. Our Lady's co-operation in the redemption of the world gives us a fresh view of her magnificence. Neither the Immaculate Conception nor the Assumption will give us a higher idea of Mary's exaltation than the title of co-redemptress. Her sorrows were not necessary for the redemption of the world, but in the counsels of God they were inseparable from it. They belong to the integrity of the divine plan. Are not Mary's mysteries Jesus' mysteries, and His mysteries hers? The truth appears to be that all the mysteries of Jesus and Mary were in God's design as one mystery. Jesus Himself was Mary's sorrow, seven times repeated, aggravated sevenfold. During the hours of the Passion, the offering of Jesus and the offering of Mary were tied in one. They kept pace together; they were made of the same materials; they were perfumed with kindred fragrance; they were lighted with the same fire; they were offered with kindred dispositions. The two things were one simultaneous oblation, interwoven each moment through the thickly crowded mysteries of that dread time, unto the eternal Father, out of two sinless hearts, that were the hearts of Son and Mother, for the sins of a guilty world which fell on them contrary to their merits, but according to their own free will. — Fr. Frederick Faber, The Foot of the Cross.